“My Native American name is Payic Iabac (First Buffalo) of the bear clan. I am from the Turtle Mountain Band of the Chippewa Tribe. I was born in Salinas, California in 1953. I grew up in boarding schools starting with the Wahpeton Indian School, Wahpeton, North Dakota, and finished my high school days in 1973 at Flandreau Indian School, Flandreau, South Dakota. In 1974, I had the opportunity to work with pipestone. This is where I found my God-given talent to work with my hands. 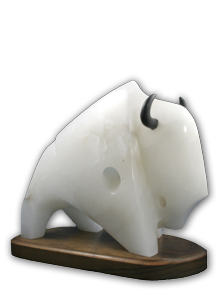 In 1974, while living in Belcourt, North Dakota, I had the opportunity to work with a stone called alabaster. In 1996-98 and 2000, I taught sculpture at Nebraska Indian Community College. I have had works in many competitions, exhibitions and markets including the Akta Lakota Museum in Chamberlain, South Dakota. Others include the Northwest Indian Art Show and Market, Portland, Oregon; United Tribes Indian Art Show and Market, Bismarck, North Dakota; Haskell Indian Nations University, Lawrence, Kansas; Black Hills Art Expo and Pow-Wow Rapid City, South Dakota; Artfalls Show and Market, Sioux Falls, South Dakota; SWIA Art Show and Market, Sante Fe, New Mexico; Denver Indian Center Cultural Arts Festival, Denver, Colorado; United Tribes Indian Art Show and Market, Bismarck, North Dakota; Northern Plains Art Show and Market, Sioux Falls, South Dakota; Naanooshke Art Show and Market, Mt. Pleasant, Michigan and the Heard Museum Guild Indian Fair Market, Phoenix, Arizona." Thomas' art is available through the Akta Lakota Museum online gallery.